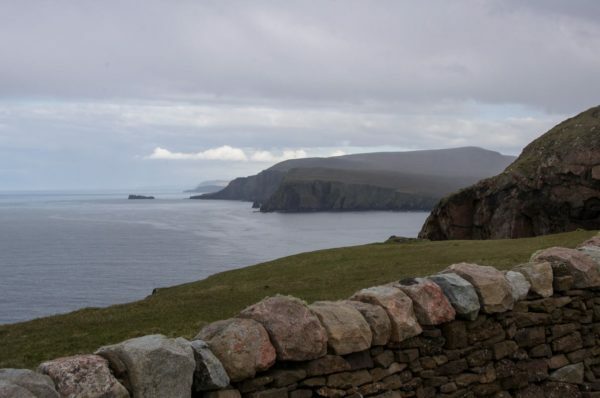 Cape Wrath is just about the most isolated spot on mainland Scotland, with no real road access. It’s also the only actual Cape in Scotland that I’m aware of. Good enough reasons to pack a rucksack and set the alarm for very early. Sneaking quietly out the house without winding up the dog too much I set off before Edinburgh woke up. The sun was rising nicely as I crossed the Forth Bridge and even the A9 was empty enough to be bearable as I ploughed on. Finally, by mid-morning, a 5 hour drive from Edinburgh saw me setting off on the track to Sandwood. I was deliberately trying to pack light, so it was only a 30l backpack with a tent, sleeping bag and cooking kit. Probably rather too much camera gear and not enough fishing kit, but much less effort required than hauling a 65l pack around. 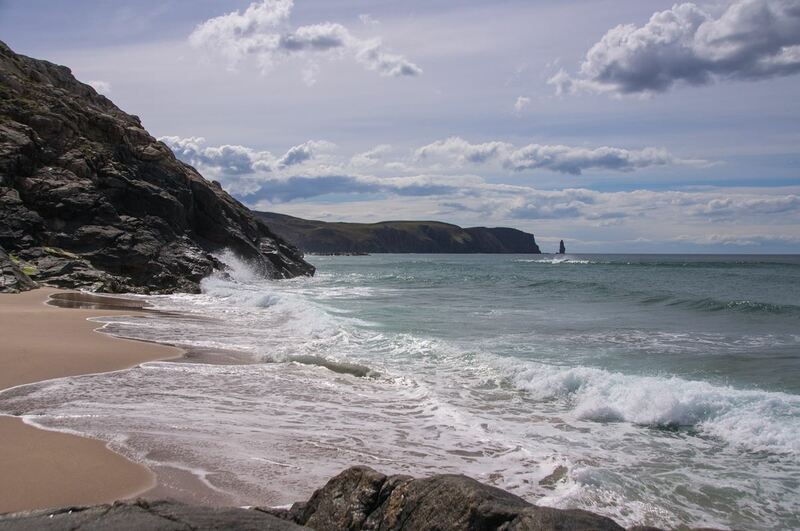 The first part of the trip, along to Sandwood Bay, is an easy hike along a well maintained little trail so I made rapid progress and was descending into the bay after 90 minutes or so. 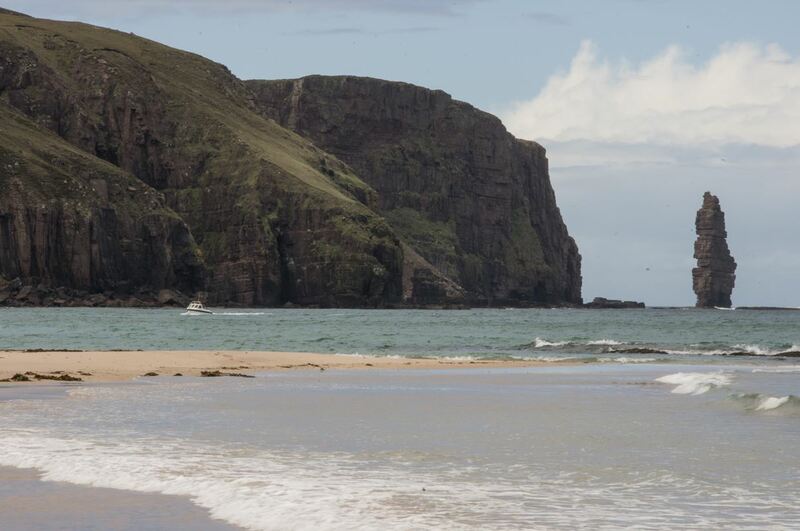 Sandwood is an iconic beach flanked by high cliffs and backed with grassy dunes and a fine peaty loch, and you get a great view as you drop down towards the sea. Way to the north, the lighthouse at Cape Wrath is just visible above the hills. Sandwood wasn’t my destination this time, but I felt obliged to give it a little shot to see if anything was hungry so stopped off towards the end of the beach and dug out some gear. 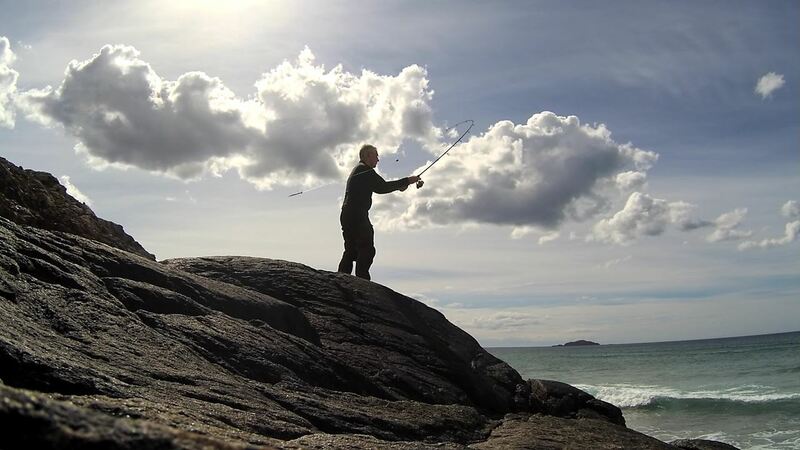 My little 6’6” spinning rod was mightily outgunned by the surroundings but we gave it a couple of casts with a 1oz lead and a mackerel sliver. Nothing seemed terribly interested, but it was an ebb tide and a hot, sunny day, so I wasn’t hugely surprised. The sun was hot by now so I filled my water bottle from the nearby river and then sweated my way northwards over the low hills that guard the route to the Cape. There isn’t really much of a trail here and you make your own way across the mixture of peat bog, heather and machair style grasslands. Nothing much grows higher than six inches or so, and the areas of bare grit and rock bear witness to the ferocity of the wind along this very exposed coastline. None of that today though, and the light breeze was definitely welcome in the strong sunshine as I marched on towards my campground. Keisgaig Bay isn’t pretty in the way Sandwood is, but it is a fine, lonely spot to spend a night. I pitched the tent on a small promontory overlooking the most northerly salmon stream in mainland Britain – a mere shadow of its normal self in these dry conditions – and made a well deserved coffee as I took a short break. My plan was to leave most of the gear in the tent and then head up to Cape Wrath and back before nightfall, so I couldn’t hang around for too long. 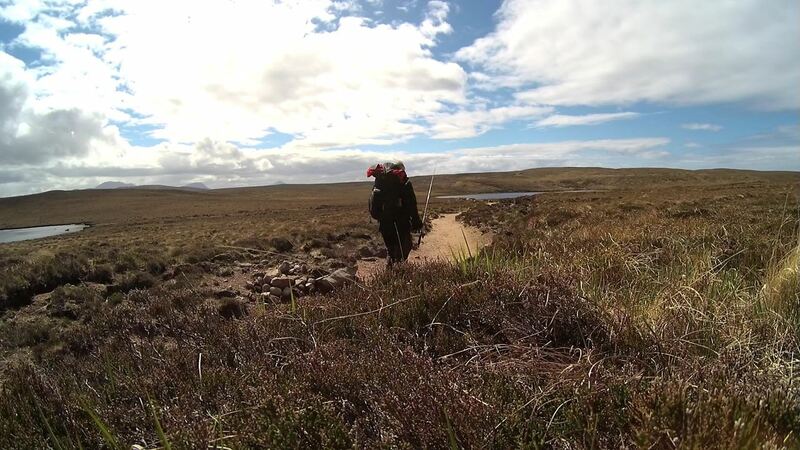 To get out of Keisgaig involves a 600 feet climb up the hills to the north, which took a little while on a hot day, but was then followed by a fairly easy trek across dried out peat bog. Further on I encountered progressively wetter conditions and it didn’t take much imagination to appreciate how much more difficult this territory would be after a decent spell of rain. 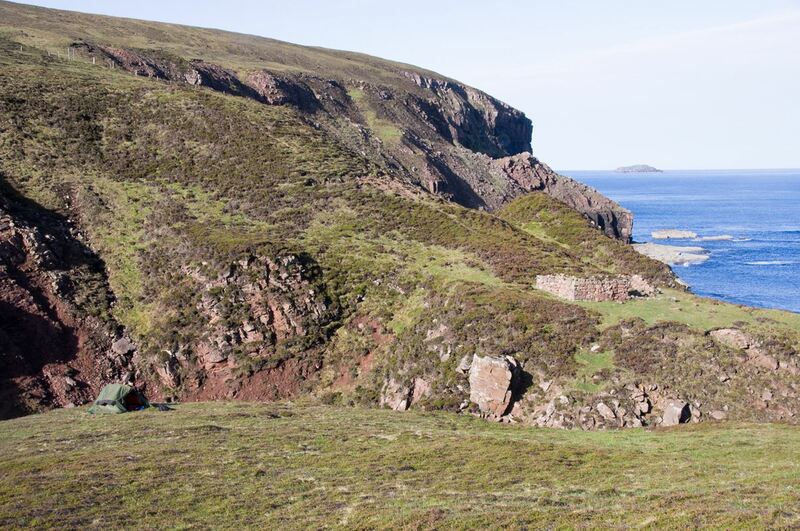 By comparison the final stage to Cape Wrath is almost an anti-climax along a rather beaten up army track. There was no-one else around as I took a few photos and nibbled on a snack before heading back south. This time I hugged the coastline a bit more closely which was quite a bit harder going but also let me identify any opportunities for a man with a rod in the future – and there are definitely some spots where the shoreline is accessible without abseiling gear. All in all I was feeling more than a little tired as I stumbled back down the hill into Keisgaig and unzipped the tent door. I awoke the next morning to find the sun had returned after some overnight showers, so it was time for some breakfast and to watch the seals lounging around the bay whilst I had a coffee and sorted out my plans for the day. 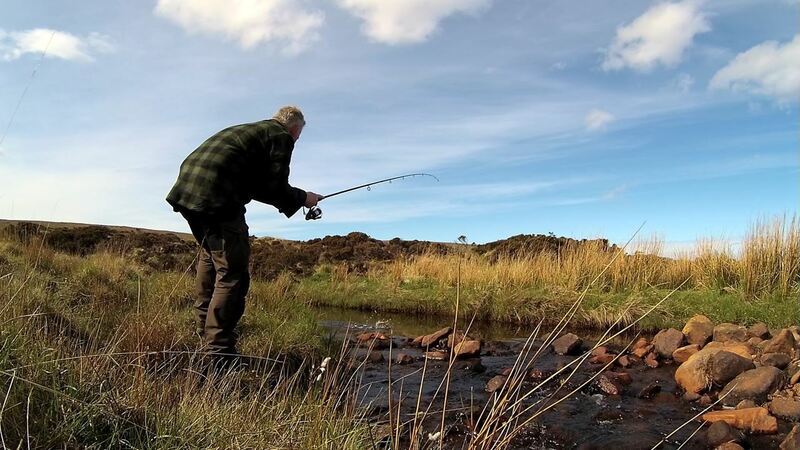 The idea was to give my rod a little bit of both fresh and saltwater action as I made my way back to Sandwood and then to the car, so I tied on a little Mepps 00 lure to some light braid and set off in search of a trout or ten. I spent the rest of the morning exploring, trying a couple of lochs and several burns for any stray trout. 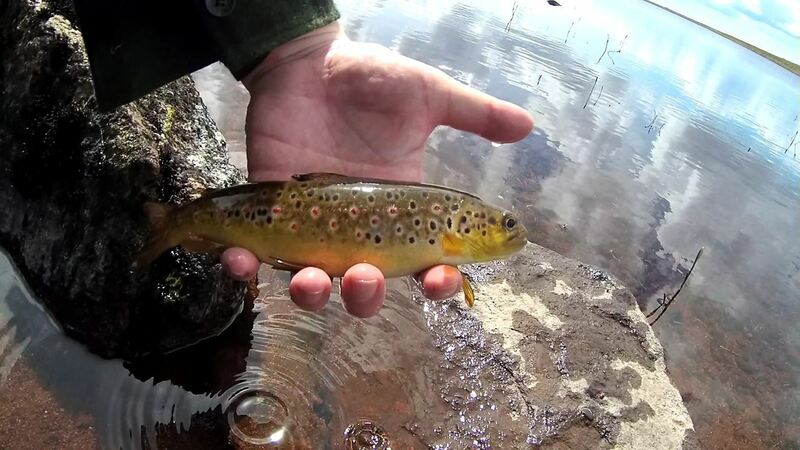 These proved very obliging and easy to catch, although quite small (hardly a surprise in such a harsh environment) and I only drew a blank on one loch. 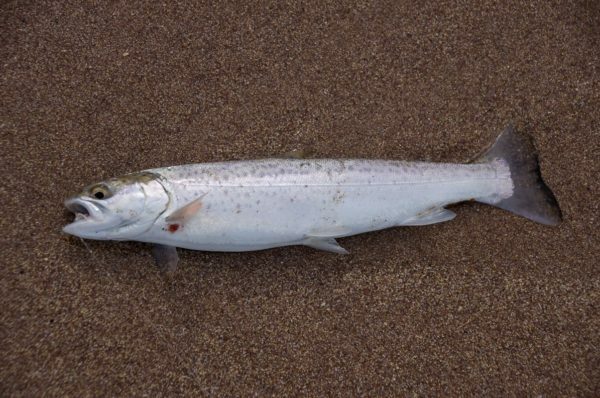 After amassing 13 or 14 very prettily marked fish (all returned) I rather reluctantly decided to return down towards Sandwood and try a beach a little to the north. Washed by a light surf and crystal clear Atlantic water it was almost a privilege to mark a line of footprints in the sand of this fine little beach as I headed towards a large rock outcrop in the middle. Even the rock felt hot to my fingers as I climbed up under the sun and made myself comfortable. 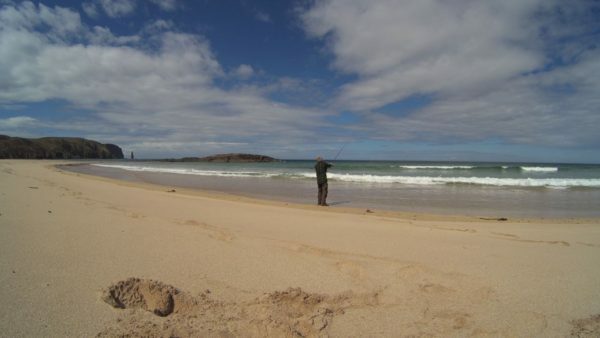 Armed with only a little spinning rod, and able to see the sea bed quite clearly through the surf for a long way out, I can’t say I was terribly confident about actually catching anything. However I went through the motions and slung another mackerel strip out into the breakers before settling down into my usual coffee making ritual. Twenty minutes later I noticed the line was slack and felt a decent weight on the rod. Even with light gear I can’t say there was much of fight, but you certainly knew that there was a fish on as the little rod hooped right over. 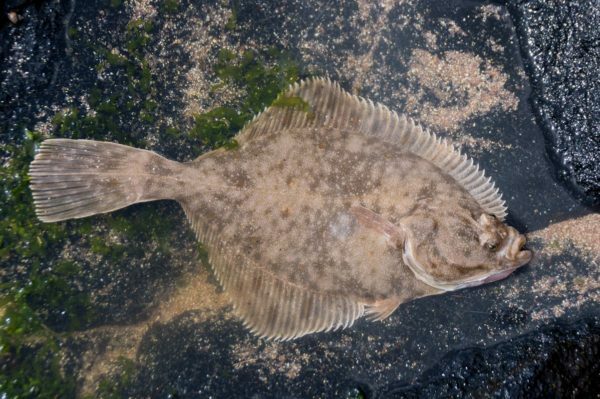 A flounder isn’t exactly in exotic territory but it was certainly welcome and I was pleased to add to my species count for the year. Confidence boosted I rebaited and cast out again, before settling down to be roasted again. A combination of snoozing and some complacency meant that I was very late to wake up to another slack line bite, and my line was hopelessly snarled up in the kelp at the base of my rocky perch before I realised I’d a fish on. I could even see it clearly 30 yards out in the surf as it swam effortlessly in the waves – a small sea trout. It took another thirty minutes before the tide cleared the bottom of the rocks sufficiently to let me clear my line and land the fish. Not large but it was still welcome proof that there was something worth fishing for! By now it was getting closer to my “I’m still alive” check-in with home, and I still had a fair way to go and no mobile reception. Rather grudgingly I packed up and gasped my way up the hill and then back down to Sandwood. The beach was busier now, with 2 or 3 tents and at least a dozen people strung out along its length, so I was quite glad not to stay this time and content to head back towards the car at Blairmore.